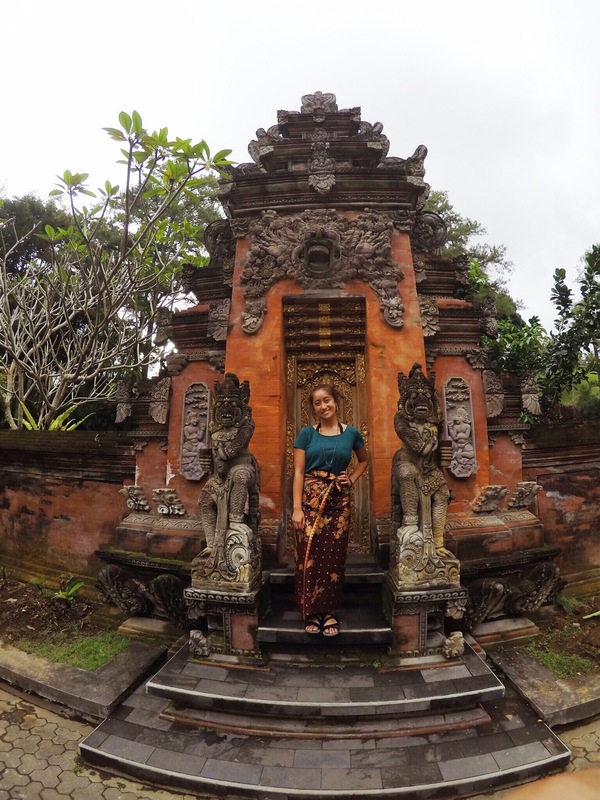 The day after visiting the rice terraces, some Bali rain started to our and my Bali Belly had worsened. I was nearly bed ridden for the entire day and stayed in our room while the rain continued to pour. Josh was also coming down with a really bad cold, and had to start taking antibiotics as well. The next day I was feeling a lot better. We woke up to find Alvin some Kopi Luwak (since he was the only one well enough to drink it). The first place we went to, Seniman, which was super nice and trendy, but ironically didn’t serve any Kopi Luwak. We drove down the street to a local herbal store called Utima Spice, where Alvin and I (mostly Alvin) splurged on essential oils, face serums, incense, and body mists. We drove down to another coffee shop called Animali, where Alvin was finally able to try his Kopi Luwak. Since I didn’t get to try more than a sip, I won’t write a full comprehensive coffee review until I get to try it. Hopefully soon! 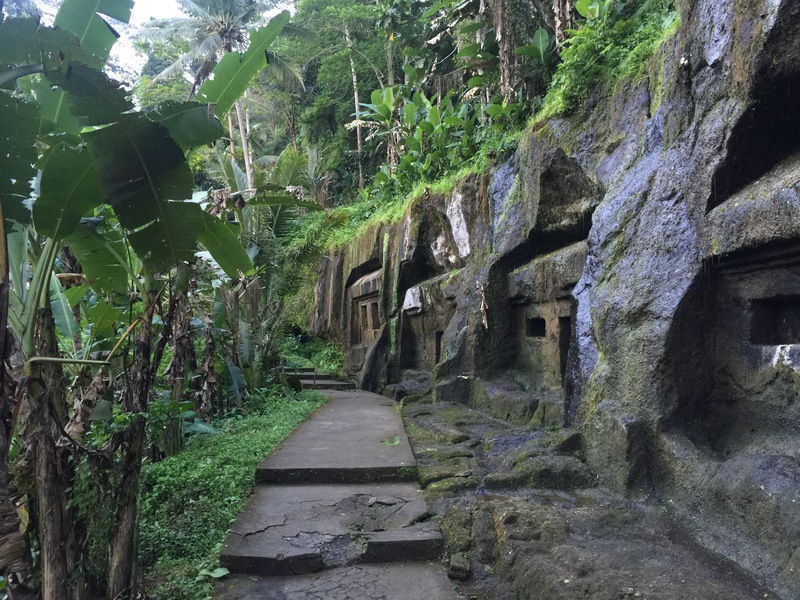 By around 2PM, Josh and I felt well enough to finally explore more of what was near Ubud. 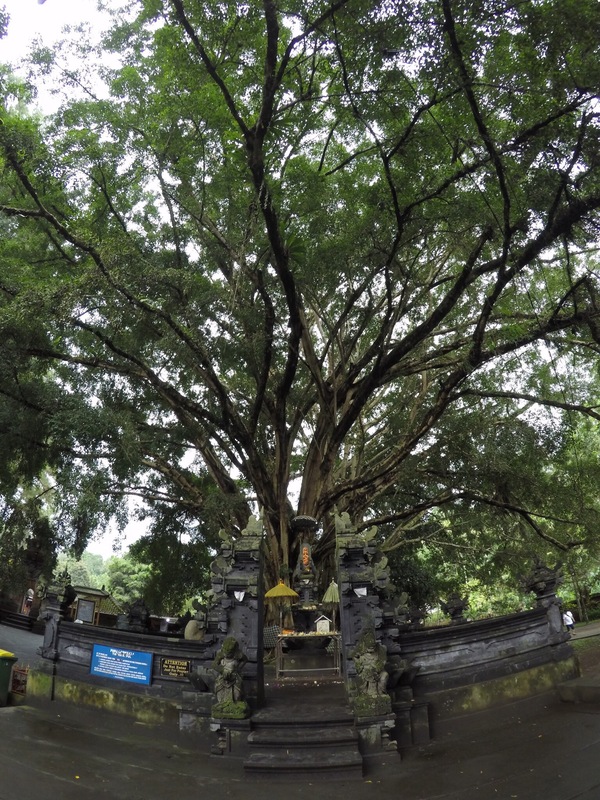 We planned on going to the Gunung Kawi Temple, which was about a 30-minute drive to the city of Gianyar. We followed our GPS which took us through winding roads, and then through beautiful green terraces that we stopped to take pictures at. Once we got to the town, we were led to a small street that ended up being a dead end. Supposedly a lot of tourists end up going there because of following a GPS. One of the locals there who has a wood carving shop ended up catching up with us as we were walking to the temple. 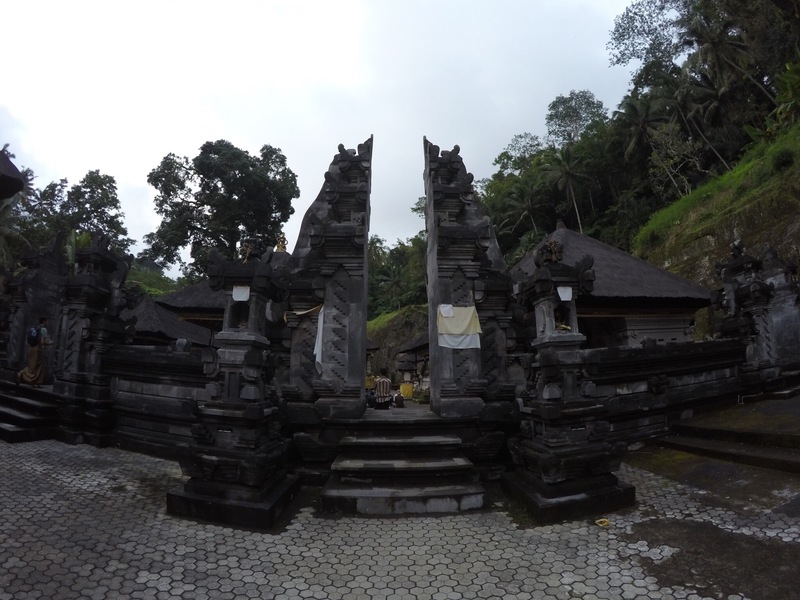 He offered to take us through the back way to the temple, which was through muddy rice terraces. Josh and I both soaked our feet walking through the mud and decided to go back after finding out there was actually a FRONT away to get to the temple. We thanked our friend and turned around to find the entrance. 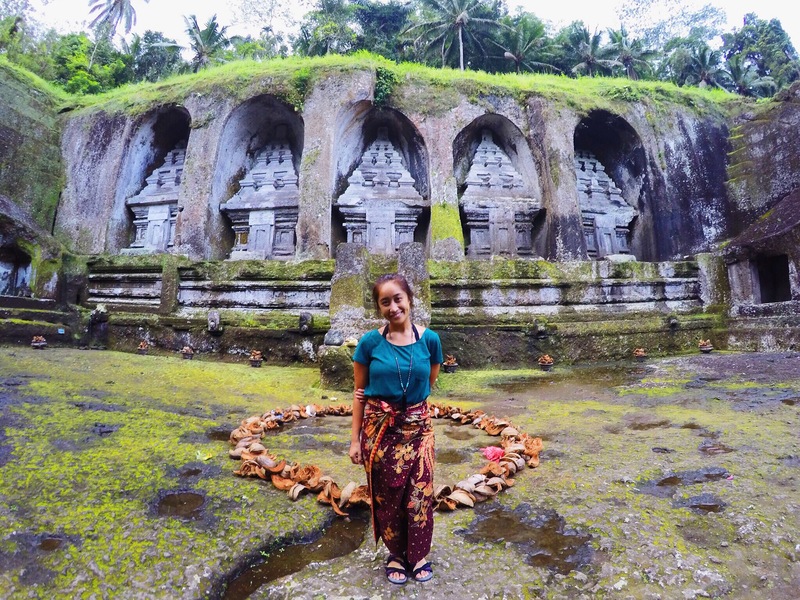 On our way to Gunung Kawi, we spontaneously decided to visit another temple that was on the way. 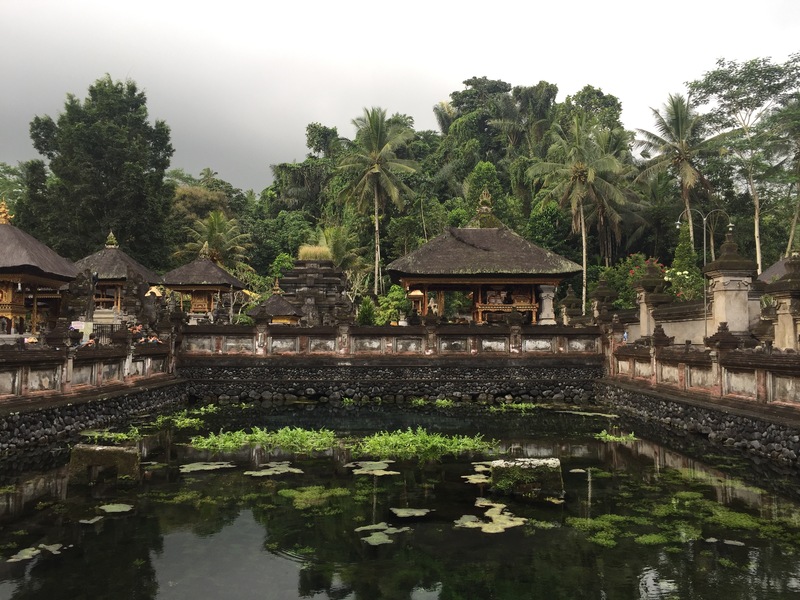 We saw a lot of vehicles going towards Tirta Empul and followed them down the road. We went inside with our sarongs and joined the many, many tourists who were inside admiring the temple. A large Hindu god statue greeted us as we walked inside. 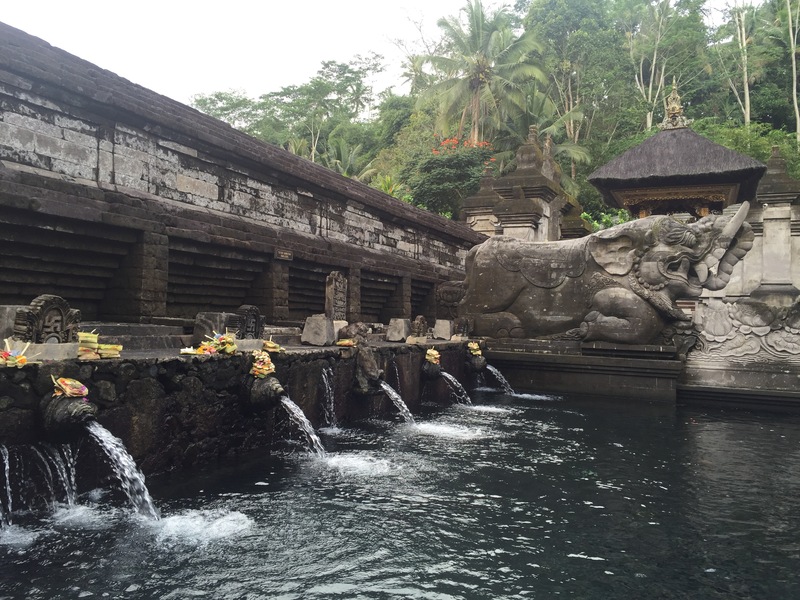 We walked inside more to find a very large fountain in the middle of the temple grounds. People were going inside the fountain with their sarongs and under the falling streams of water to say a prayer and receive blessings. 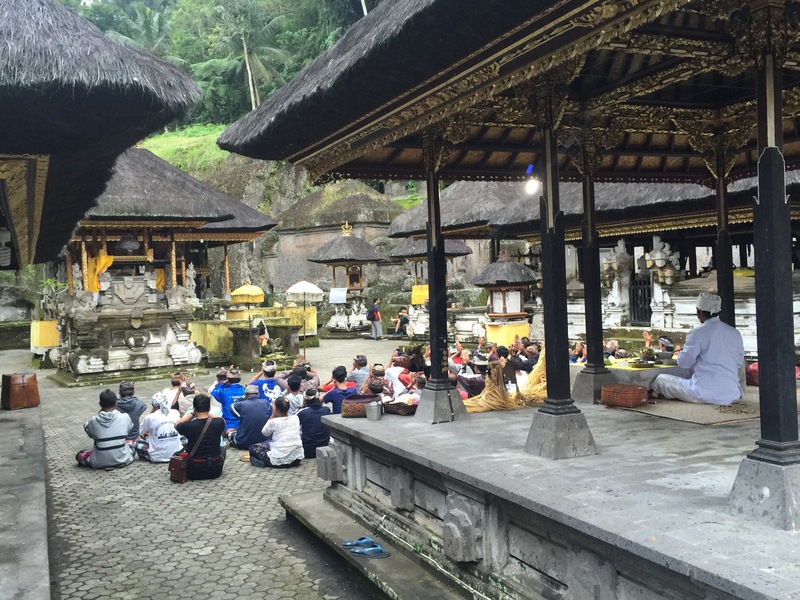 On our way through the exit of Tirta Empul were merchant stands left and right selling Balinese clothes and souvenirs. Determined to not buy anything, the boys and I walked through without making eye contact with any of the merchants… Until Josh decided to stop. And then I stopped. And then Alvin stopped. 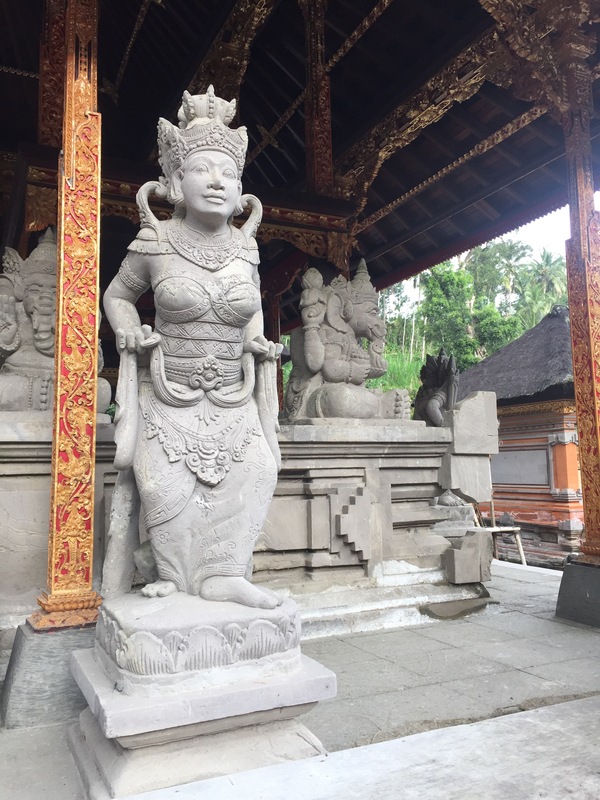 I ended up buying a wooden sculpture of a Balinese woman which I had been wanting to purchase, while Alvin bought a giant golden Buddha mask and two totem poles. Although we were a little guilty that we did a little impulse buying, we knew that we were supporting the locals who weren’t making that much money that day because of the rain. Finally we made it to Gunung Kawi. We walked 270 steps down to the temple, where we entered what felt like a completely different world. I wasn’t expecting the temple to be what it was. I wasn’t anticipating how huge, intricate, and beautiful every inch of that temple was going to be. Almost immediately there was a new aura that we felt as we entered the temple. We were soon greeted by five huge statues carved out of a the stone wall. 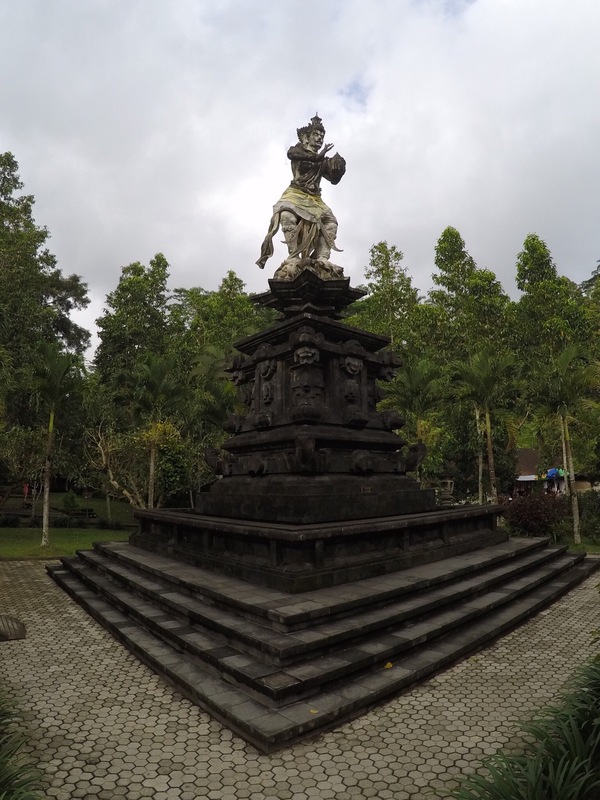 The statues are supposed to be memorials to a royal family from many years ago. There are memorials all over the temple, which according to legend, the were done in one night by the fingernails of Kebo Iwa. 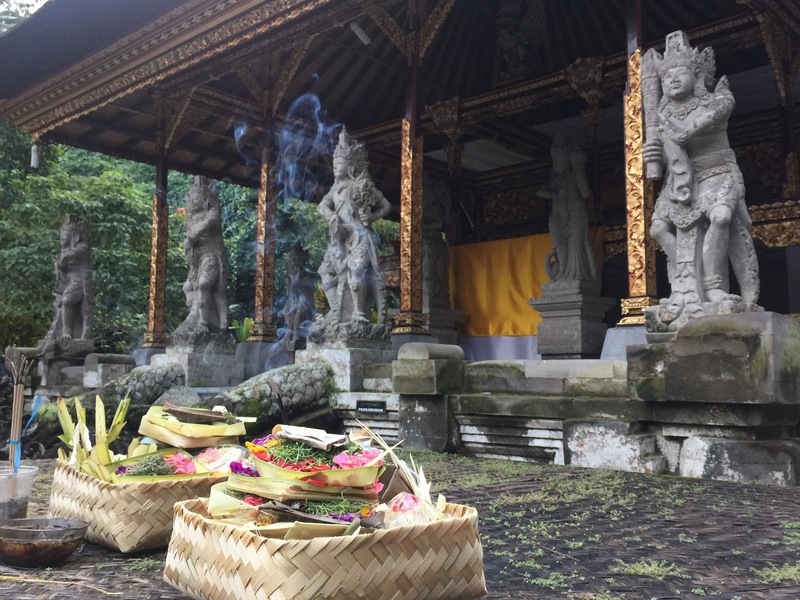 By the time we got to the temple, it was already late and the sky was misty and cloudy. There were only a few tourists who were visiting the temple at the time, which was a really nice break from our other tourist-heavy destinations. Wayne Dyer (author of a book I’m reading) talks about places with peaceful energy so strong that it enraptures anyone and everyone who enters. He used Machu Picchu in Peru as an example of one of these places. A place of peace where no war or conquest had taken place. 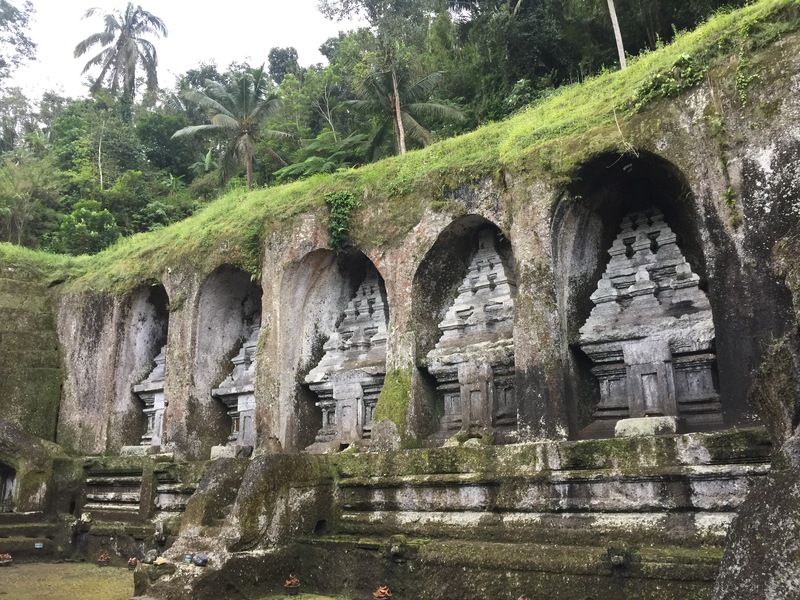 I immediately assimilated that feeling with the Gunung Kawi temple. Although I’m not too familiar with the history of what happened there, the fact that it is still standing beautifully with people still praising the gods is astounding in itself. We walked through more of the temple, which seemed to never end. I joked with the boys that “It just keeps getting better and better!! !”, as we walked through the temple. We admired the flowing rivers that were abundant because of the rain the passed few days. And on our way back we took a look at the lush green rice terraces inside of the temple as well. We hoped some of the sun would peep through the sky for sunset, but the rain clouds prevailed. Josh, Alvin, and I climbed up the 270+ steps back up to the entrance. Tired and sweaty, we finally made it back to the top, and headed back home since it was going to get dark. Personally, I could have spent all day hanging out at that temple, just enjoying and intaking all the positive energies there. I definitely recommend giving yourself at least an hour or two to explore the entirety of this temple. On our way home, the boys and I stopped by a shop that sold sacred geometry jewelry and adornments (I can’t quite recall the name of the store right now). I couldn’t get my mind off of a pair of Flower of Life earrings that I saw in the shop the first day we arrived. The earrings were gone by the time we got there, but she was happy to make me a new pair of silver ones. I bought them for 400,000 IDR (around $30), which is a bit pricy, but worth it since my soul was calling for them. We ended our day eating on restaurant row again in Ubud near Sania’s House. It was our last night here in Ubud and I had green mashed potatoes (which was pretty gorgeous of me considering my case of Bali belly!). Josh and I went to bed hoping we’d wake up the next morning feeling ten times better for our upcoming travels to the mountains of Angseri, Bali.